Yesterday I prepared one of my favorite chicken recipes that I found on the internet some time ago. I also prepared it for my mother-in-law on her birthday. And she didn’t make a comment about it needing salt, which was a relief. 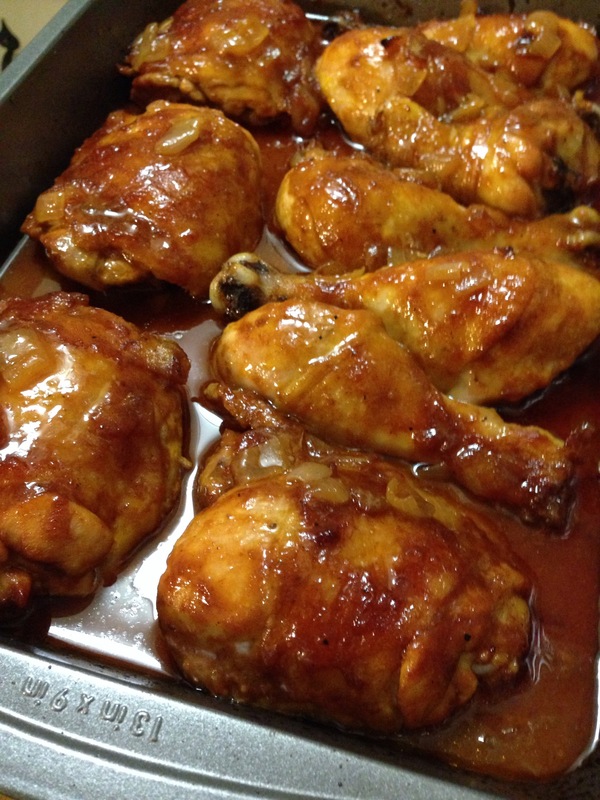 The flavor was there in this simple and delicious oven barbecued chicken recipe. I paired the chicken with oven baked yams and a macaroni salad that I through together with leftover pasta that I I had used to make oven macaroni and cheese on Sunday night…yum! I knew that I didn’t need the full pound, so I set some aside with the intention of making the mac salad. I added red bell pepper, black olives, green onions, celery, dijon mustard, olive oil, mayonnaise, salt, pepper, garlic salt with parsley, and dinner was served. I had an appointment later that evening with a school counselor to ask some questions about the certificates in accounting and to see where I’m at. In a way, the appointment was a waste of time. I think I already knew where I was at. But, it’s part of the process. I think next time I have a visit, it will be more helpful because I may be closer to my goal, unless I begin to waver again. Time is not on my side. Many of the classes that I took so long ago, no longer count because in order to obtain the certificate, in my case, in accounting, the courses need to be completed within 7 years of the date of the certificate; 10 years for a business certificate. I don’t know that this little piece of paper will help me down the road, but I thought if I had the classes already, I might as well. I waited too long, mainly because I’ve had a love/hate relationship with accounting for as long as I remember. And that’s why I’m asking myself, do I really want to petition to retake accounting principles because I got a C in the class I took way back when. I know there’s something inside of me that feels the need to go through a semester length course and to possibly pick up the certificate along the way. I also figure I may as well still aim for obtaining my A.A. except that for the area of emphasis, the time rules still apply. I think I need to do this, so that I know that I at least followed through and completed something…but part of me, thinks is it really necessary. It’s an inner battle that I’ve been going back and forth with forever. And even though community college is a lot less expensive, it still puts a dent in the budget. The good thing is that there is no time limit on general education requirements. Back to the drawing board to see what I really want to do and if getting the piece of paper that is of little value in the real world is worth it, and to make sure I’m not fooling myself into completing something that I really have no interest in completing. 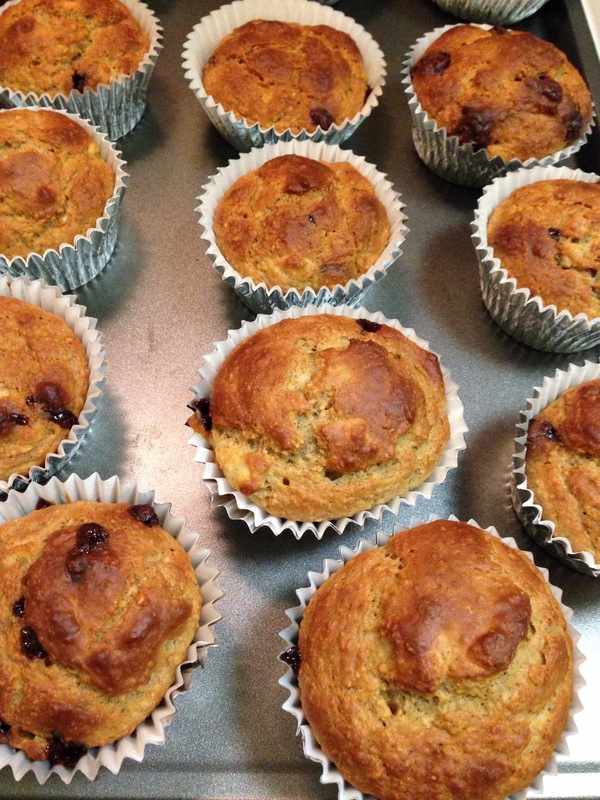 All that I could think about on the way home was the two ripe bananas that I’ve been waiting to be just right, so that I could make banana muffins. I found a recipe in the Moosewood Restaurant Low-Fat Favorites recipe book. I didn’t need the recipe to be that low-fat, so I added two full eggs instead of one egg and one egg white. The recipe also called for 1 cup of rolled oats blended just until they were the consistency of corn meal–a nice healthy touch in addition to one cup of white flour. There was 1/4 of brown sugar, 1/2 t. of baking soda, 1 t. of baking powered, cinnamon, a dash of nutmeg, 2 T. of vegetable oil, 2 ripe bananas mashed, 1/2 cup of plain yogurt, and instead of the 1/2 cup raisins, I added 3/4 cup of milk chocolate chips because I had some leftover and I thought it would be a nice addition. 400 degrees for 25 minutes and the house was smelling of banana and chocolate goodness! I’ve never really been a muffin person, and I’ve had this cookbook for years and have only made a handful of recipes out of it, which were all good. And I have to be honest, I usually steer clear from a muffin with chocolate in it, but I think what did me in was when we stayed at a place in Carmel that brought muffins and juice to our door in the morning and I bit into a muffin with chocolate in it and I thought, this is actually pretty good. I guess that stuck in my head; ironically, hubby didn’t like the muffins and he loves chocolate. I do know that the ripe bananas were my inspiration. I saw two sitting there on the counter, as I’ve seen before, only this time, I wanted to make them into something, rather than send them away. That’s when I looked in this particular cookbook hoping for a recipe because that other low-fat recipe book with the blueberry scones, it’s going back to the library! Yesterday I had an excuse to go the library. When I was searching the library database for a book, I discovered that I had two books that were overdue by a week. I usually watch for those email reminders, but I must have overlooked these. I happily pulled the books from the pile, snapping a photo of them because I wasn’t done with them yet! I was happy because I would return the books, then browse the shelves after collecting a book that I was in search of and knew was on the shelves. After I self-checked in my overdue books, I pulled out my iPhone, and opened the email that I had sent to myself with the call number: 808.02 NAMING. I wound my way toward the back of the library, walking past tables of chattering teenagers. As I walked further and further down the narrow passages of books, I found myself at the end. I looked up and scanned the call numbers and there it was: Naming the World and other Exercises for the Creative Writer Edited by Bret Anthony Johnston. I took the book from the shelf, admired the red cover with a small image of a piece of art titled “Cockatoo and Corks,” a piece of art that is interestingly strange. I love surreal art. Instead of going back down to the front of the main library the way I came, I decided to go over one isle and I found myself in the cookbooks. I turned left and right and saw that baking was on my left, so I started there. There was one cookbook that was displayed: Krystine’s Healthy Gourmet Cookbook by Krystine Crowell. 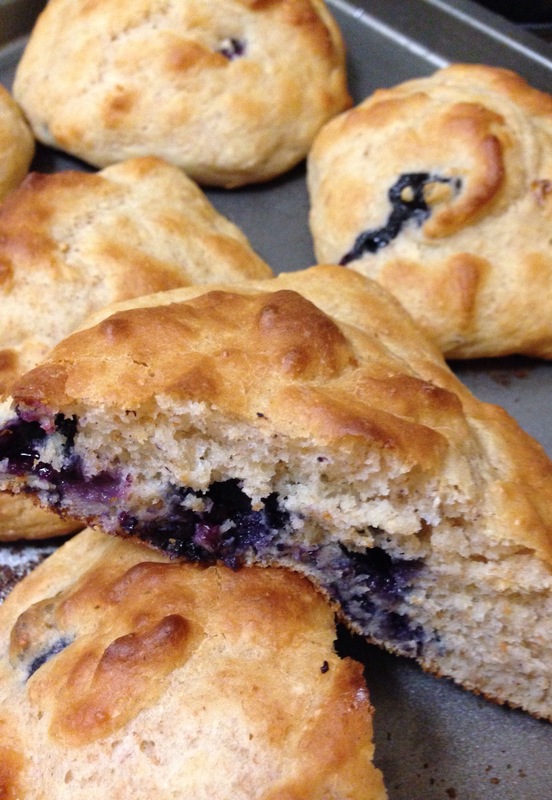 I flipped through, and in the first several pages, I saw a nonfat whole-wheat blueberry scone recipe that caught my attention. I decided that I would take the book and I would make the recipe that night. All I needed was the yogurt and blueberries. I turned to the right and eased my way down until I saw some Mexican cookbooks. I took two. I wanted to wander a bit, but as always, time slips right by me when I’m in the library. I knew that I couldn’t browse for too much longer because I had to get home and wash dishes and start on dinner. But I did make a last stop to scan the new books and that’s where I found The Public Library: A Photographic Essay by Robert Dawson. I flipped through and knowing that I wouldn’t have time to read it now, I would have time to skim and I wanted to take my time looking at the different libraries that he included in his book. One sculpture in the book took my breath away. Titled “Psyche” it touched something deep within my own: A huge sculpture in the shape of a head, made up of roughly fifteen hundred small sculptures of books and butterflies, suspended in air. That was my last book, I went to the self-check machine to check out the handful of books that should have only been the one that I came for. The machine beeped at me and said my card was about to expire and that I needed to go to the circulation desk. I took my books and walked up to the standing desk. The librarian asked how she could help me and I explained. She just needed my identification and my library card would be renewed for another three years. She looked up, as she was typing into her computer and said, “Your shirt is making me want to be in Hawaii.” I looked down at my deep blue Hawaiian shirt with large white flower blossoms. I looked up and smiled. It was refreshing to have someone actually bring up their own astrological sign, someone who was older, and relate to me. So many times, I’ve done the same. And so, we continued our brief conversation, two friendly Cancers, as she processed my library card renewal. She told me how she was married in Kauai and what a beautiful island it is. I mentioned how I had heard many good things about it, but that’s one of the islands I had not been to. We finished up and instead of going to the self-check machine, I had the librarian check my books out. She was such a kindred spirit, a nice change from dealing with machines and others that are too busy or who aren’t’ as friendly. And this friendly exchange was all thanks to my expiring library card and my Hawaiian shirt. I did make the blueberry scones first and they were different. They looked pleasing. They lacked a little flavor, especially after coming after oatmeal chocolate chip cookie bars. With a little dab of butter, I think they’ll be almost perfect.